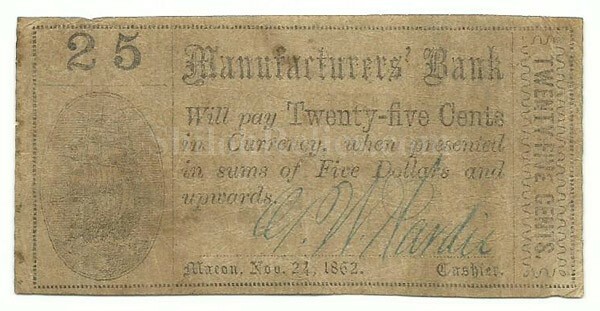 This is an attractive original Civil War 25 Cent note from the Manufacturers’ Bank in the state of Georgia. It was issued from Savannah, Georgia and is so marked on the front of the note along with the issuance date of November 24th 1862. This note has a simple but effective design. It has the bank name in the top center of the note and on the left hand side has the image of the sailing ship. The note is correctly hand signed in ink at the bottom. The note is in well-circulated condition. It comes in an acid free holder for display and preservation. What is special about this note is the paper that it is printed on. During the Civil War paper was in short supply. It was cheaper of the bank to buy paper that had already been printed on rather than buy new paper. 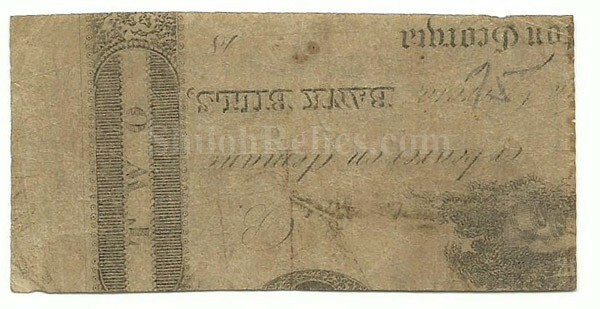 If you notice this note was printed on paper that had already had currency printed on the back. I heard a man call these "Hard Times” notes one time and that is a great way to describe them. It makes a neat thing to show your friends when you show them your Civil War collection. The note measures 3-1/2 inches by 1-3/4ths inches in overall size. It comes in an acid free holder for display and preservation.